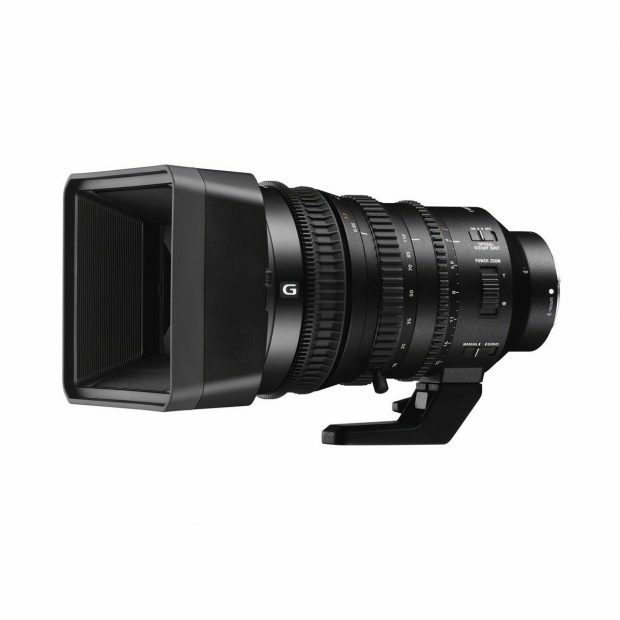 Wide ratio (6.1x) power zoom lens: This advanced powered zoom lens has been designed for optimum performance in pro-standard Super 35mm / APS-C moviemaking applications. Starting at 18mm wide-angle and extending through an impressive 6.1x zoom range, it offers a constant F4 maximum aperture all the way. High-quality G-Lens optical design – ideal for 4K moviemaking: Six aspherical elements and three ED glass elements in an 18-element 15-group design effectively suppress spherical and chromatic aberration throughout the zoom range, from the image center to periphery, achieving high resolution that is ideal for 4K production. Smooth Motion Optics (SMO) design and construction: design and construction minimizes unwanted focus and image shifts while focusing or zooming for stable, high-level 4K movie production while ensuring smooth, quiet operation. Focus “breathing” or shifts in angle of view during focusing are minimized by an internal focus mechanism. Constant F4 max aperture: Maintains exposure and depth of field regardless of the focal range you chose to zoom to. When changing your aperture to defocus the background, the areas outside of the focal plane appear blurred. This ‘bokeh’ effect of the blurred background can be enhanced with circular aperture blades used in this lens. Servo / manual mechanical zoom w/ switchable zoom ring direction: High-level zoom functions include responsive manual zoom in addition to servo zoom for precise and flexible control in any situation. A mechanical drive system for manual zoom operation ensures direct, responsive control with no lag. Independent Zoom, Focus and Iris rings for superior control: Independent focus, zoom and iris (aperture) rings offer superior direct operability and reliability for professional visual production. Inner focus and zoom: Internal focus and zooming means the overall length of the lens remains constant. This makes it easy to use matte boxes and other lens accessories, and also minimizes center of gravity shift so that the lens remains ideally balanced for stable shooting. Super Sonic wave motor drive for zoom with internal zoom structure: This power zoom lens offer enhanced control and expressive potential for moviemaking, with smooth, consistent zooming that is difficult to achieve manually. Details like smooth acceleration and deceleration are important too, and of course tracking is excellent throughout. Silent Iris and linear AF drive system for quiet operation: Noise while adjusting iris or focus can be an unwanted distraction on your movie soundtrack. Sony’s advanced iris control and linear AF motor drive system achieve quiet focusing that is also extremely responsive. Optical SteadyShot image stabilization for video and stills: Gyro sensors built into the lens detect even the slightest movement, and the stabilization lens is precisely shifted to counteract any image blur that might occur. ED glass / Super ED glass: . ED (Extra-low Dispersion) glass dramatically reduces chromatic aberration at telephoto ranges, and provides superior contrast across the entire image, even at large aperture settings. Super ED glass provides enhanced compensation for chromatic aberration. Aspherical lens elements: Aspherical lens design dramatically reduces spherical aberration while also reducing lens size and weight. Extend your focal reach w/ 1.4x and 2.0x teleconverters: Get the distance with the optional 1.4x and 2.0x teleconverters. Compatible with both SEL14TC and SEL20TC teleconverters, the SELP18110G can extend its reach to 25.2-154mm and 36-220mm respectively (37.8-231mm and 54-330mm equiv. in 35mm format on APS C and Super 35 cameras). Designed with video in mind: For maximum mobility, this lens features a compact, lightweight design compared to similar focal range lenses for video. A removable tripod mount bracket is convenient for transport and storage. With both 1/4″ and 3/4″ screw sockets it adapts easily to video and still photography tripods.